Dimock was Otis K. Dimock (1856-1913) and Fink was Martin D. Fink (1855-1917). Otis Dimock was born in Seymour, Connecticut, 1 January, 1856, and his death notice in the New York Times, 29 Sept. 1913, p. 9, reads, "Suddenly on Friday Sept. 26th, Otis K. Dimock of New York, beloved husband of Lida L. Wolcott. Funeral will be held at his Summer residence, Ocean Av., New London, Conn., on Monday, Sept. 29th, at 2:30 P. M. Carriages will meet trains leaving Grand Central Depot at 10 and 10:02 o'clock." Martin D. Fink was born in Brooklyn, Dec., 1855, and his death notice in the New York Times, 14 Dec. 1917, p. 13, reads, "Fink. - On Wednesday, Dec. 12, at his late residence, 600 West End Av., New York, Martin D., beloved husband of Annie B. Fink. Funeral service Friday, Dec. 14, at the West End Avenue Collegiate Church, 77th St. and West End Av., at 10:30 A. M. Interment private." Otis K. Dimock appears in New York City directories in 1884, dealing in machinery and pipe supplies at 77 Maiden Lane. Dimock Fink & Co. came into being about five years later at 79 Maiden Lane and 212 E. 125th St. The company continued at these two addresses through 1891, then were located at 80 John St. and 214-216 E. 125th St. from 1891 to 1897. This ad for Dimock & Fink appeared in the catalog of the Harlem Library, 1893. Wrought and Cast Iron Pipe and Fittings. Up-Town Store 214 & 216 East 125th St., N.Y. In Jan. 1897 Dimock applied for a passport for himself and his wife, Lida L. Dimock. He stated that he was born 1 Jan. 1856 in Seymour, New Haven County, Connecticut, and that his wife was born 18 Feb. 1868 at Eatontown, New Jersey. He asked that the passport be sent to Otis K. Dimock at 80 John St., New York City. The following appeared in the Biographical Directory of the State of New York, 1900, regarding Otis K. Dimock, "Plumbers' Supplies, 220 East 125th street, New York City; residence 205 West 57th street. Born in Connecticut, 1856. Educated in Connecticut. (Married.) President Dimock & Fink Co.; director Norwood Engineering Co. of Massachusetts and William P. Baker Co. Member Atlantic Yacht, Richmond Country and New York Athletic Clubs." The following appeared in The Historical Register: A Biographical Record of the Men of Our Time Who Have Contributed to the Making of America, by Edwin Charles Hill (1919), "Martin D. Fink was born in Brooklyn, N. Y., December 19th, 1855, son of Martin and Katherine Fink, formerly of Bremen, Germany. He was educated in the public schools of Brooklyn, and at the age of sixteen started upon his business career as a clerk in a large wholesale plumbing supply concern, James Jacobs & Co., where he displayed remarkably sound judgment and unusual executive ability, combined with strict application to business. He was promoted rapidly and given an interest in that firm. In 1886 started in business under the name of Dimock & Fink. While Mr. Fink took high rank in the commercial community of New York, he was also actively engaged in real estate, as an operator, displaying a far sighted appreciation of the future growth of New York... He married December 19th, 1882, Anna L. Bernard, daughter of Charles and Anna (Waldron) Bernard, and had two children, Capt. Charles M. Fink of the United States Army and Mrs. George G. Tarbell. 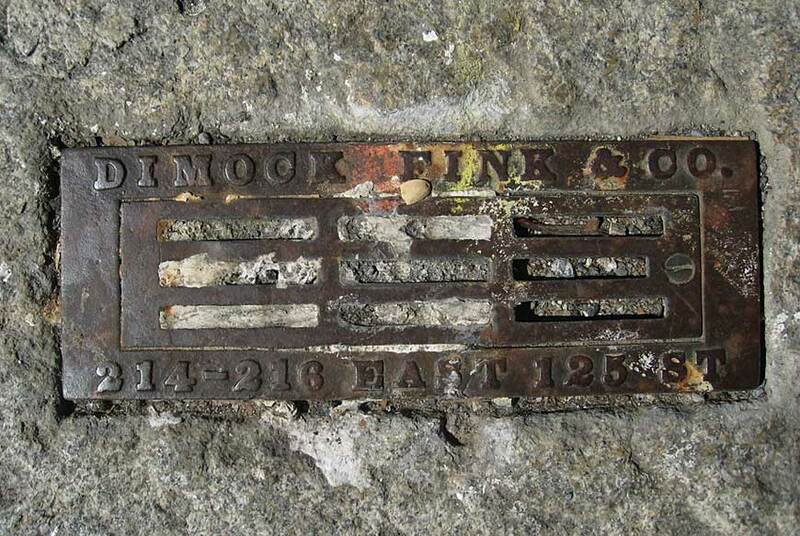 Mr Fink died December 12th, 1917." Dimock & Fink Co. had their main office at 220 E. 125th St. from 1898 until the early 1930s. The 1914 Manhattan telephone directory also listed a Bronx branch at 3497 3rd Ave. and a New Rochelle branch. From 1929 to 1931 they were also located in Mt. Vernon, Westchester County. 3497 3rd Ave. (near 168th St.) in the Bronx was their last listed address in 1939. After Dimock's death in 1913, his widow, Lyda L. Dimock (1868-1931), became an officer in the company. Then after Fink's death in 1917, George Louis Kumpf (1879-ca.1940?) became secretary and treasurer. At a later date Kumpf became president of the company. A brief notice in Sanitary and Heating Age, 1898, reports, "The employees of Dimock, Fink & Co., the plumbing supply house in 125th street, New York, have aspirations for honors in the baseball field, and on receipt of their challenge the employees of the Colwell Lead Company, 61 Centre street, New York, sent them a highly entertaining letter recounting their honors in this field a few years ago..." For more on the Colwell Lead Co. see the Colwell page.